Is man descended from an ape? This assumption entered permanently into the canon of school textbooks. Few scientists dare to question this. Prof. Maciej Giertych decided to try. He formulated a series of scientific arguments demolishing the theory of evolution. In 2006 for a presentation in the European Parliament he invited scientists who supported his view. The presented book is the fruit of the discussions held on that occasion. We constantly observe the dying out of species (devolution) while we do not see the appearance of new ones (evolution). 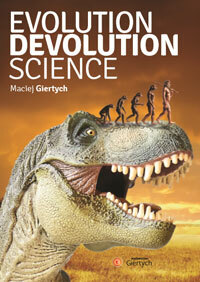 The books shows that eminent palaeontologists, physiologists, geneticists and sedimentologists negate the theory of evolution while supporting the hypothesis of devolution. Accumulation of genetic diseases (genetic load) endangers the very existence of our species. It is easier to show that it is dying out than to claim it evolves. This concerns not only man but also all other species. There are many organisms that do not fit into the postulated evolutionary lines. Among fossils we see stasis and not sequences of progressive changes. Genetics shows how races are formed by reduction of genetic information but it does not provide evidence to support the theory of information growth (evolution). In the book besides the scientific perspective also a religious one is given. The majority of confessions oppose the theory of evolution in spite of the fact that a view dominates that evolution was adopted by all, including John Paul II. Catholics, Protestants, Orthodox, Jews and Muslims in common favour creationism. In contrast to the general opinion the pope was not uncritical of Darwin’s idea. The book is in the form of a richly illustrated textbook. In view of its simple language it can be recommended to anyone. It boldly demolishes the unproven dogma of the theory of evolution that took possession of minds throughout the western world.